I'm working on a project for one of my classes where my group is conducting a survey. We asked our participants to estimate how much time they spend on social media. Since the project is not complete yet I won't be sharing any results, but it really got me thinking about how much time I dedicate to my phone. There is not a single part of me that wants to cut social media out completely. I still derive value from perusing Twitter and scrolling through Pinterest, but I can get the same enjoyment (and get a lot more work done) if it is designated to certain times of day. Try to figure out when you experience a lull and use it as a break. Maybe right after lunch it's hard for you to get back into work, so set aside 15 minutes to take a look. I used to open up my social media right when I woke up, but now I am saving that for slow morning weekends and instead springing right out of bed during the week. I've posted about social media minimalism before and how to consume media consciously, but it's so important that it warrants repeating! I find that when I open Instagram I like to look at it until I get to the last post I saw. That means that the more people I follow the longer I will need to have the app open until I am "done." Does anyone else feel that way? Therefore, the less people you follow the less time you will spend looking through new content! There are a lot of great reasons to spend time on social media: gather inspiration, escape into a daydream, keep up with your favorite influencers and friends. But there are also some pretty bad reasons to be tied to your phone: comparing your life to others, using social media as a yard stick, constantly checking to see how many likes you get for validation. When you use social media for good purposes it will not become an imposition on your life and you will not be addicted to it. That's why it makes sense to continually evaluate and know your purpose so that you can make sure you are getting the most good out of your time! 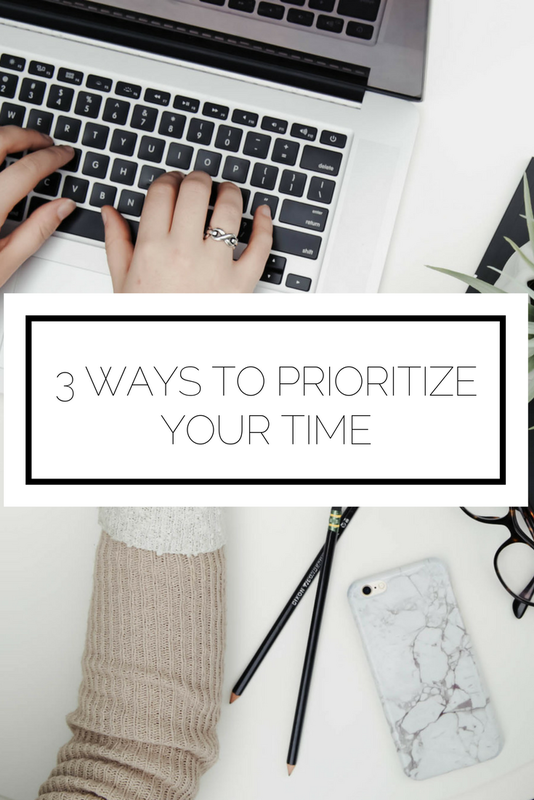 There you have it, 3 ways to prioritize your time and fight against the pull of social media. Check out other productivity posts here, here, and here! Do you have any advice on this topic? Anything that you find particularly tough?